Father and son Sjaak Van De Velde have been among the top players in the extreme long distance in The Netherlands for decades. They gained a reputation as a team that delivers fantastic results with limited means and a small team of pigeons. They have an impressive palmares in the national and international races, with well over 100 top 100 prizes in national competitions since 2004. About every fancier from The Netherlands is familiar with the combination of Sjaak van de Velde & Son. Sjaak (66) is a retired fisherman, and his son Sjaak (45) works for a building materials distributor. The two have been involved in a fantastic combination since 1993, and they have excelled in some of the most prestigious and most demanding races on the international calendar since day one. We travelled to Breskens in Zeeland, and we immediately got a warm welcome from Sjaak Van de Velde Sr. himself, who worked his entire career on the "Breskens 14", a 45 metre long fishing vessel. We sat down to talk to Sjaak in his spacious garden right next to the Westerschelde, where he built a loft for his breeding birds. "We do not have too many of them but they are all excellent", he says. "We sold one of our better racing birds a while ago, and we still regret that decision today", his son adds. Since then, all of their best racing birds have gone straight to the breeding loft. The racing birds are kept in the lofts of Jaak Senior. This is an impressive list indeed. And if that should not be enough for you, feel free to browse through an overview of all top 100 prizes at national and international level! And it goes without saying that these top results have led to several championship titles as well: the team claimed quite a few national and international ace pigeon or championship titles over the years, which we summarised in the following overview: national and international championship titles in recent years. 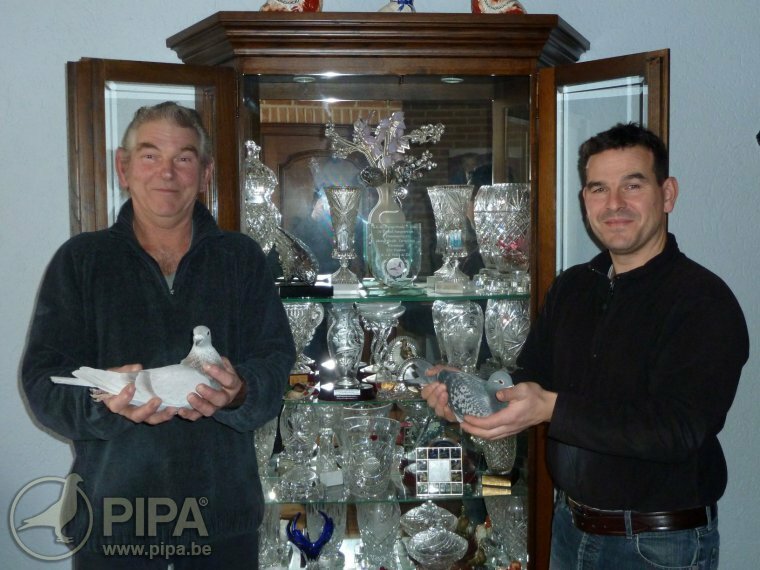 The craftsmanship of father and son Van de Velde and their top quality pigeon collection offers plenty of opportunities. We would like to take a closer look at some of the big stars of father and son Sjaak, starting with the phenomenal De Flits NL13-3308425. De Flits stems from breeding pair De Flip NL09-1264065 (half brother of several national winners) x 't Super Kweekstertje (the dam of at least 13 national top 12 winners). De Flits claimed the title of 1st National Ace Pigeon Perpignan 2015-2018 this season, and he is also 2nd National Ace Pigeon Perpignan 2015-2017. This is the type of bird that any fancier dreams of adding to his collection one day! Click here to read more about De Flits, his pedigree and his palmares. Another big name in team Van de Velde is none other than 1st National Ace Pigeon Extreme Long Distance The Netherlands 2016 Super Luc NL12-3207535. This racing bird has won an astounding number of top prizes over the course of his racing career. You can tell that this is a very strong racing bird indeed. Raise your hand if you think you have a better bird in your collection. Super Luc comes from Luc van der Gucht, and he was bred from NL11-3011751, the son of a 1st National Pau 2005, and from a daughter of the renowned Blauwe Perpignan (2nd National Perpignan 2003 and 2nd National Dax 2004). Click here for the pedigree of the fantastic Super Luc. Click here to read an earlier report that we wrote following Super Luc's title of 1st National Ace Pigeon Extreme Long Distance The Netherlands 2016. Another gem in the lofts in Breskens is Kleine Dure. 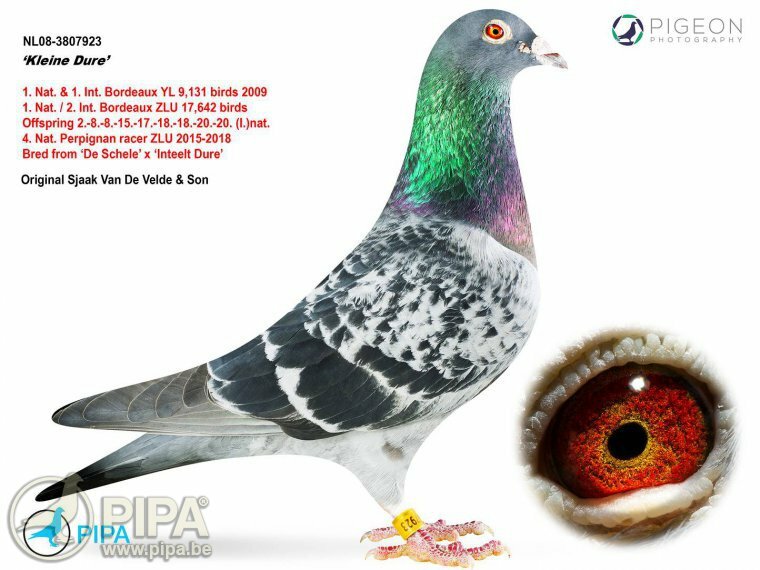 This racing bird has definitely left his mark on the Van de Velde pigeon breed; he is worth his weight in gold. Kleine Dure was prepared for his first major competition back in 2009, and father and son Sjaak will still vividly remember his first important race. Kleine Dure landed on the board at 8:58'33" pm with a speed of 990 m/min (after a flight of 13 hours and 13 minutes straight), claiming a 1st National and 1st International Bordeaux Yearlings of 9,131 pigeons. 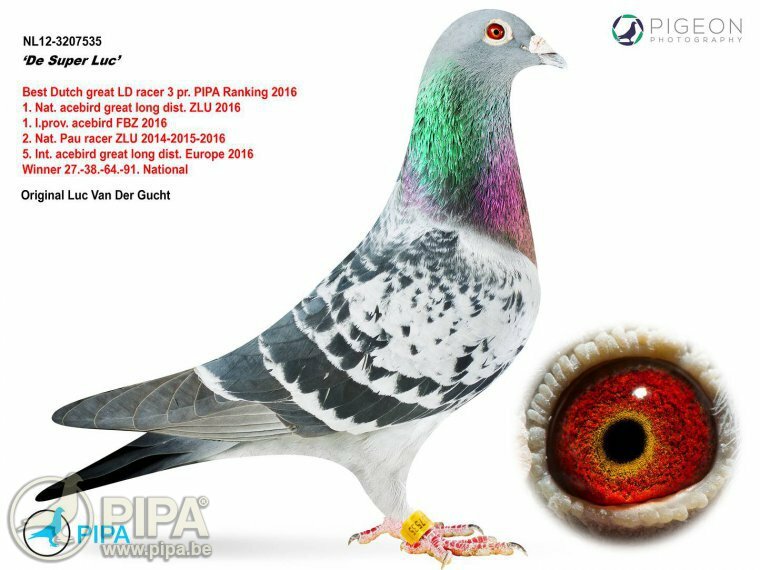 On top of that, he wins a 1st National in The Netherlands overall of 10,481 pigeons, and a 2nd International of 17,642 pigeons. Father and son Van de Velde were convinced that this was an achievement from a highly talented and very strong racing bird. That is why they decided not to sell their Kleine Dure, despite numerous offers from intersted fanciers. In fact, Kleine Dure was the only racing bird in this team that was sent straight to the breeding loft after his victory. Even the team's best birds and national winners can usually continue to race for the remainder of the season but that was not the case for Kleine Dure. He got a well deserved spot in the breeding loft almost right away, and father and son never regretted their decision: Kleine Dure turned out to be an excellent breeder. 20th National Perpignan ZLU 4,978 pigeons 2013 “De Kim”  1st Yearling Nat. (4978 p.)/ Int. (15,106 p.). Click here for an earlier report on the national first prize from Bordeaux of 10,239 pigeons. The race from Perpignan has become an annual highlight for Team Van de Velde; this is the race for which they line up their strongest birds. Sjaak Senior is always keen to go the extra mile for the last international classic of the season, and it really shows. 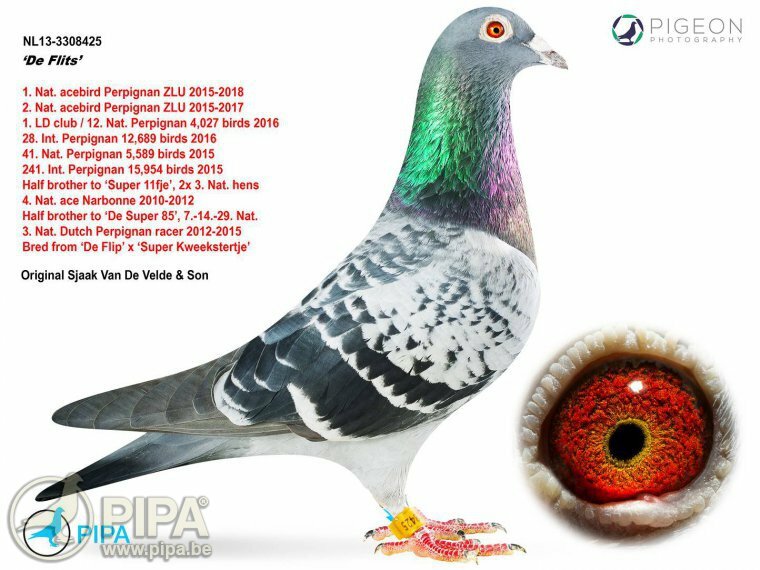 Some of their ace pigeon titles from Perpignan have been briefly mentioned in this article, and these are the result of an impressive series of national top prizes from Perpignan over the course of seven seasons (2011-2018): 2nd - 7th - 8th - 11th - 12th - 20th - 21st - 29th - 32nd - 33rd - 41st - 45th - 90th - 91st - 101st - 107th - etc. In other words, father and son have claimed a national top 50 prize from Perpignan no less than twelve times, which is absolutely fantastic. We visited a highly motivated family of pigeon fanciers. This is a family that leaves nothing to chance and that really looks after their pigeons. They are also very likeable, they always speak their minds, and they are clearly capable of delivering great results right when they have to. We really enjoyed witnessing how passionate this team is, operating from a rather modest pigeon loft, working with just a small selection of pigeons. And yet, they were able to win almost everything they could. Even their best racing birds can continue to race: they will alwash finish the racing season, even if they are particularly gifted (Kleine Dure was the only exception). Many of their best birds breed just a limited number of youngsters, since they continue to race when breeding. "You have to make choices sometimes", Sjaak Junior explains. "Given the limited amount of space, we opted to race with our best birds. And let's be honest: it has worked out rather well. We have a fantastic group of pigeons. They have an excellent body type and they arrive home early. And that's what it is all about!" We could not agree more. Sjaak Sr. and Sjaak Jr. have decided to take things a bit slower with their pigeons. "We are struggling to keep up with the amount of work that we used to put into this pigeon breed. That is why our best racing and breeding birds will be sold in auction. It was a tough call to get rid of our life's work but there is not much else we can do", they say. A big thank you to the Van der Velde family for your hospitability!